Touchdown first thing in the morning, at Sumburgh Airport, Shetland, on 24 September heralded the start of a long-awaited trip to Fair Isle. We had scheduled a day on Mainland Shetland and decided to spend it birding in the Sumburgh area, enjoying the beautiful sunny conditions. By late afternoon, we had clocked up double figures of Yellow-browed Warblers but little else, and a tiring search of the iris beds at Quendale proved fruitless. However, we decided to finish the day with a check of the area downstream from the mill. As PA worked nettles and thistles towards the beach, he flushed a bird which immediately looked interesting and called SY over, saying he had an unstreaked 'Acro' warbler which appeared rather large. The view had been extremely brief and he couldn't be sure what he had seen. We approached the area it had dropped into and both got brief views, but still nothing conclusive. Things didn't get much easier for over half an hour, as we continued to get frustratingly brief glimpses of the bird. It was clearly a very large warbler, which looked pale, almost sandy brown, with a long, 'full' and rounded tail. The rump looked reddish-brown, contrasting with the tail. But we hadn't seen anything more than split-second obscured views of it perched, and flight views were not allowing a clear look at the head. To make matters worse, it kept disappearing and we were really struggling to relocate it. Skulking was an understatement! Given the bird's size and tail length (and the fact we were on Shetland), we clearly needed to consider Thick-billed Warbler. We knew this was an enormous call, especially on these views and the contrasting rump tone was not what we were expecting for this species. 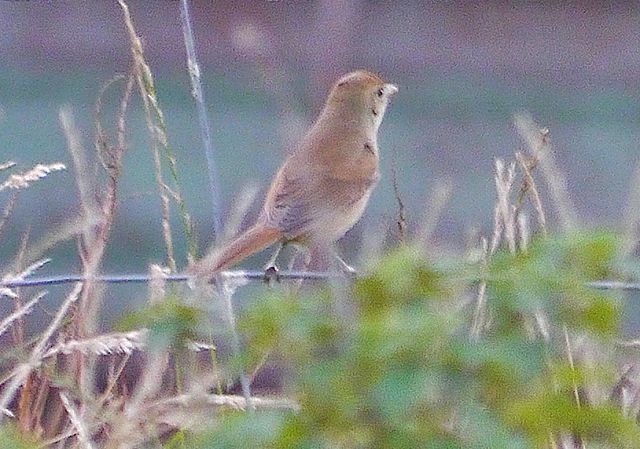 Could it be a Great Reed Warbler? We knew we had to get a clear view of the head and determine whether it had a supercilium, as well as how long the bill was. Then, the bird gave a slightly more prolonged flight view and we both felt pretty sure we'd seen the plain featureless face and short quite stubby bill of Thick-billed. It was still not showing at all well and we couldn't keep tabs on its whereabouts. At this point, PA decided to phone Paul Harvey, who lives nearby, with the news that we had a possible Thick-billed, but were struggling to get views and puzzled by the rump. Paul agreed it sounded good but confirmed he would expect a concolorous rump and tail. He suggested he asked Roger Riddington, who could be there in five minutes, to join us, an offer we readily accepted. Roger arrived, and with three of us relocation of the bird became a bit easier. Despite one moment of doubt when PA thought he saw a supercilium and Steve thought the bill now looked too long, we finally got some clinching perched views of a plain face, pale greyish lores, a beady eye and a short bill. With the sun now going in, the tail and rump looked miraculously similar in tone (the paler tail apparently having been an effect of strong sunlight shining through spread feathers). We all agreed it was a Thick-billed and the celebrations started! Thick-billed Warbler, Quendale, Shetland, September 2015 (Photos: Steve Young). Paul Harvey arrived and, after a quick word with the farmer, put the news out; within minutes, other birders began to arrive. 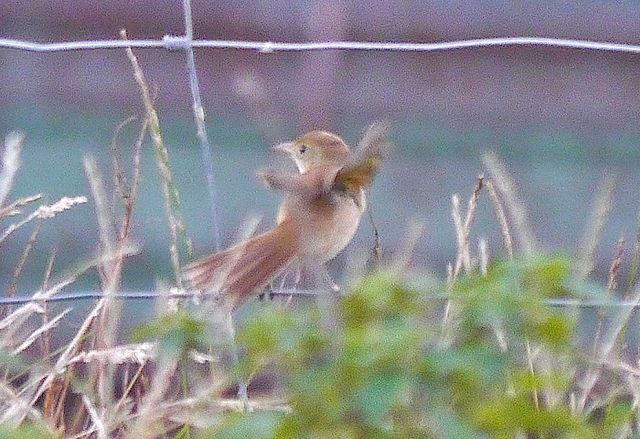 As the warbler flew downstream later, it paused on a mesh fence and finally SY got a chance to fire off a couple of record shots. Some 20 people enjoyed this mega rarity until nightfall, but it was not present the next day.